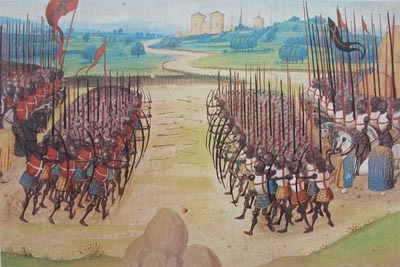 The Battle of Agincourt, on 25 October 1415, is one of the best-known events in British history. The story of Henry V’s forces epic defeat of a much larger French army has been immortalised in tales, plays and poetry familiar to all. What is less well known is the role played by Wales in Henry’s stirring victory. Five hundred Welsh archers and 23 men-at-arms travelled to fight in France and it has even been said that ‘Welsh archers were the reason why Henry V won the Battle of Agincourt’. Many of these brave men came from the Brecon and Monmouthshire region, from towns and villages strung out along what would eventually become the A40. They were joined by a small contingent from the Forest of Dean. Community groups and organisations in this region commemorated the 600th anniversary of the battle of Agincourt in 2015 with a series of 45 events including a touring exhibition. Looking forward, the initiative has been granted new funding from the Agincourt 600 Commemorative Fund to deliver a series of projects to create a lasting legacy for the local story of the Welsh archers and this period in Welsh history. To deliver the projects Agincourt 600 Wales Legacy is being supported by the following organisations: St Mary’s Priory Development Trust (lead partner), Brecon Beacons National Parks Association – Education, Brecon Cathedral, Caldicot Castle, Monmouthshire County Council, Monmouthshire Museums, St Mary’s Priory Church Abergavenny, Tretower Court & Castle (Cadw), Wye Dean Tourism.